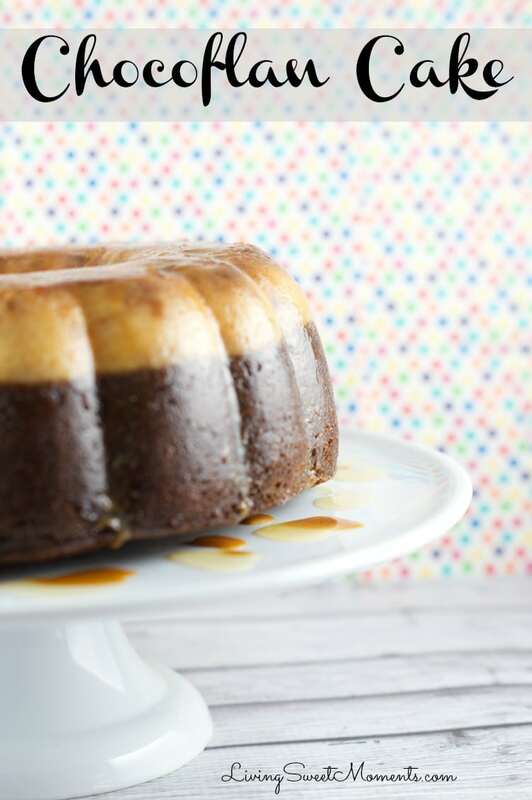 This easy latin Chocoflan cake is moist and delicious. 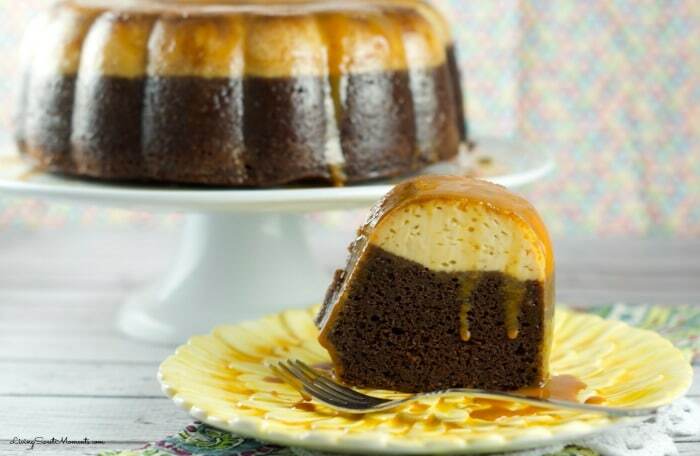 A combination of flan and chocolate cake with a drizzle of caramel sauce. 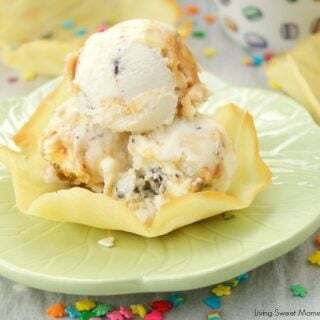 The perfect dessert to serve for any occasion. I really love this hybrid idea and believe it or not is so easy to make and will definitely wow your guests. I grew up eating flan. My mom used to make it when guests came over. It’s creamy, sweet and very soft. I don’t know anybody who wouldn’t even steal a spoonful. Flan is so versatile and it’s easy to customize it. For instance, around the Holidays I make it with Eggnog. Other times I’ve made it with Dulce de Leche. Now chocolate cake does not need any type of introduction. In Spanish we say “It’s a shot to the floor” meaning it’s a sure hit. Who doesn’t love a good piece of chocolate cake? If you don’t, substitute with Vanilla, Spice, Carrot or whatever your heart desires. 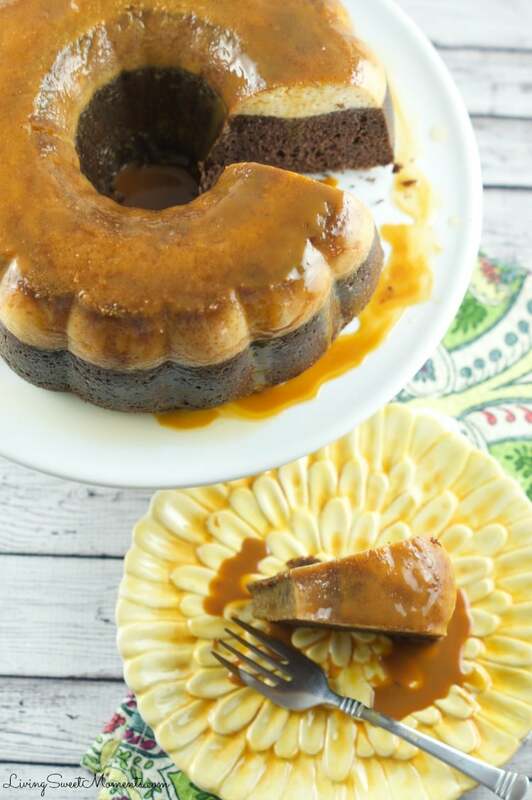 The Chocoflan Cake works because both flavors and textures compliment each other beautifully. 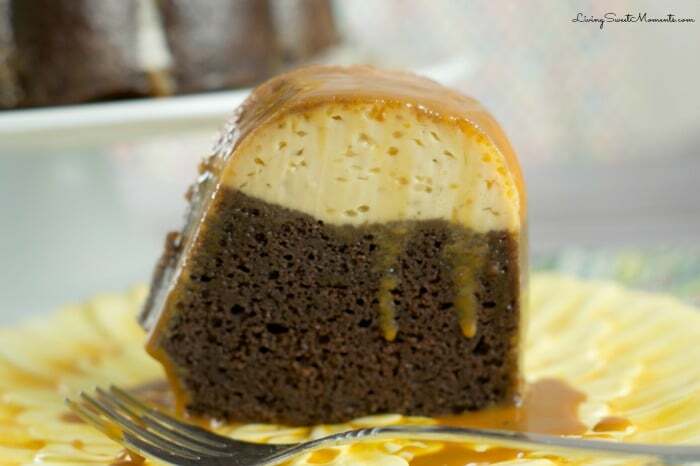 The flan gives the moisture and softness to the cake while the Chocolate gives it structure and lot’s of flavor. 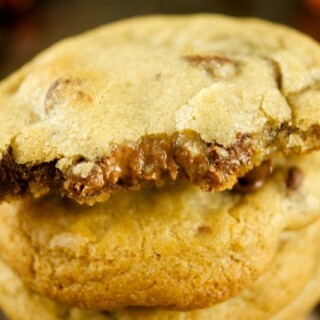 The Dulce de Leche on top just takes it to the next level. To me, it’s a showstopper and something different and exotic. Some people call this Chocoflan Cake the Impossible Cake since something strange happens to the cooking process: the layers switch over during baking. We start out first with the caramel, we add the chocolate cake and finally we finish off with the flan. When the cake is in the oven, the chocolate cake rises over the flan and ends up at the bottom. Kinda cool right? Making Chocoflan Cake is SUPER EASY and doesn’t require a huge list of ingredients. I made a video tutorial for you below in case you like to see the process. It’s my first cooking video so be easy on me 🙂 . I promise to get better and produce more cooking videos in the future. I hope you can make this delicious ChocoFlan Cake at home. If you do, please tag me on Instagram @livingsweetmoments and/or use the hashtag #LivingSweet – I promise to Repost it. 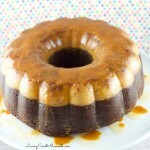 Chocoflan Cake - this easy latin cake is moist and delicious. 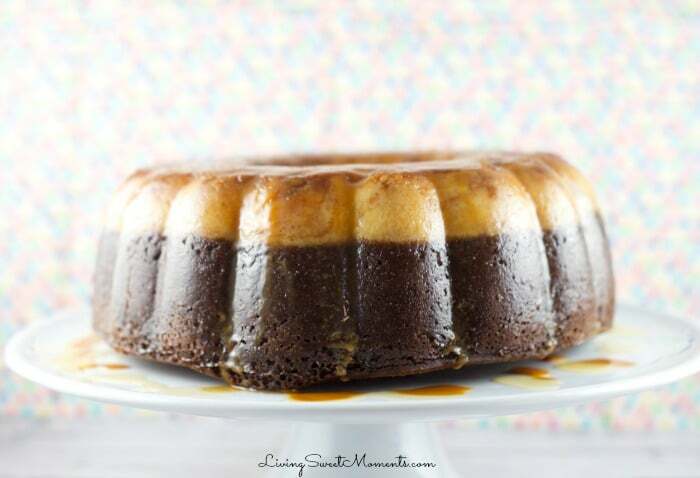 A combination of flan and chocolate cake with a drizzle of caramel sauce. Perfect dessert. Oh, we love flan in the Philippines – it’s our favorite dessert! I have never made one with chocolate and now you have inspired me. Your flan looks so delicious! What a cool cake and an even cooler trick in how ti bakes! I love flan, the concept of layer cakes made in a single pan, and the fact that the layers switch during baking. Thank you Laura! I was amazed too when I first heard about it. You meant 30 seconds for the dulche de leche, not 30 minutes, right? Just checking. This looks SO easy!!! Thanks for the great recipe! I tried your chocoflan recipe yesterday and this morning and when i took it out if my pan the flan wasn’t ready. Oh Ashley I am so sorry that happened! did you let it chill for a few hours before unmolding? How much water did you add to the bain marie? 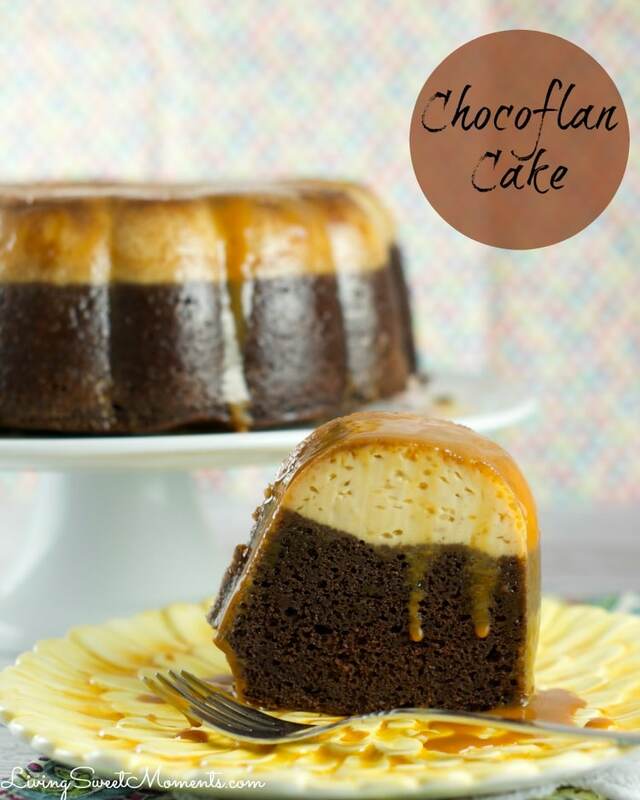 does the chocoflan need to be stored in the refrigerator or can it keep at room temperature in a cake dish? you mentioned butter for the cake because its mentioned on the box or its a must? The first time I ever had chocoflan it was store bought from a Mexican store in California. Loved it. When I cam back to North Carolina I was craving that delicious treat again. 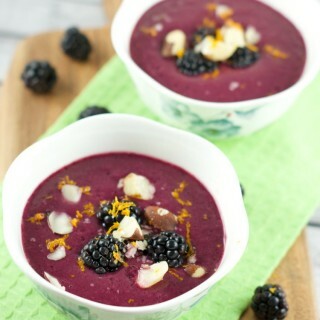 I’m so happy to have found this recipe! I’ve made it several times and it’s turned out perfect every time. Thank you so much! I am so glad Y.L! thanks for letting me know! Is it possible to add cream cheese to this recipe to make a sort of Choco flan de queseo? Hi Claudia! I haven’t tried with cream cheese! Although that sounds delicious. If you try it, please let me know how it came out. 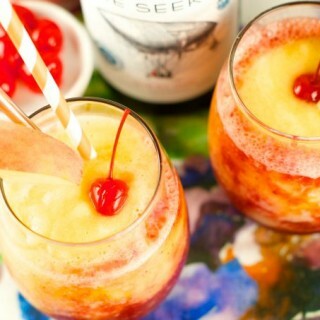 Trying this recipe tonight! Im hope it turns out. I didnt have a roasting pan to put water in, just a pot that the bundt pan fit perfectly into so had to guage the water level. hoping this turns out! Hi Hero! that’s the magic of this cake. The layers interchange during cooking. Isn’t it cool? When will the flan and cake separate? 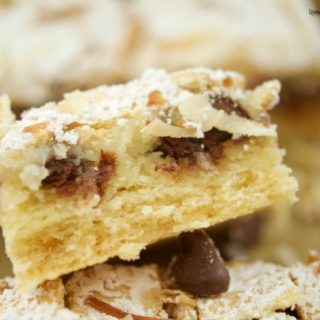 Hi Ngoc, layers separate during the baking process. But the cake needs to cool overnight in order for the flan to properly set. Did you try the recipe already? I tried your recipe and it turned out great ! Question – The caramelized sugar that is placed first in the pan (prior to baking) most of it stayed in the pan when I inverted it. It still tasted great however I believe that caramelized sugar would have added a little more sweetness to the cake? Everyone preferred it without the Dulce de Leche. Any tips on preventing the sugar from staying in the pan ? Hi Naomi, sometimes when the chocoflan is in the fridge, some of the caramel solidifies. Next time when you unmold the cake. 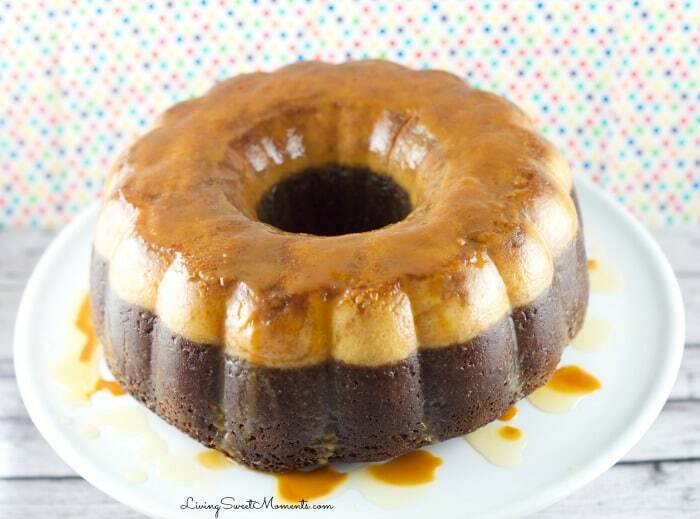 Place the empty mold on a hot water bath to see if the caramel melts a bit and then add that on top of your cake. Let me know how it comes out Naomi! On a side note, I make my flan with cream cheese and it’s delicious!! it turns out more dense and also, I love bananas so sometimes I add banana to the flan mix for banana flavor. You got that right Veronica… diplomatico does sound more elegant! Total time 1 hour 10 min. I am sorry Lex. The new recipe has a new feature: resting time. I will update the card. Sorry for the confusion. Trying this recipe tomorrow. Only difference is that I will be adding cream cheese to my flan for a more creamy taste and because that’s the only way I know how to make flan. Let me know how it comes out Tamara! My chocolate cake didnt separate all the way from the flan, my flan is brown not that creamy yellow color. My husband said it taste great the way it should but my cake presentation is not the way it should look. Any suggestions? mmmm Anela, I am sorry that happened. First, tell me, did you make any substitutions to the recipe? No but as soon as i poured my flan mix it looked more watery than yours? In your video yours looks thick mine sank as soon as i poured it maybe i need to blend it less time. My flan looked like dark flan. Im using a super moist chocolate fudge cale mix is that ok? Maybe the flan ratio was off? Did you leave some condensed milk in the can? Love your video for choco flaun. I have made it twice now and turned out great. Thank you so much. You’re welcome Joseph! thanks for your feedback. Glad you liked it!